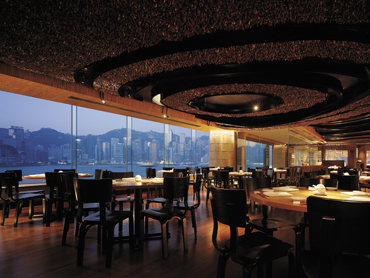 When I worked in Wanchai, we would always go for special occasions and take visiting colleagues and clients for Dim Sum lunch at Dynasty in the Renaissance Harbour View hotel. I think it’s a Cantonese restaurant at night, but I’ve never been. This was our expenses lunch venue of choice! Food: Dim Sum dur. Beautifully executed with a wide-ranging menu. The right mix of richness, freshness, textures and flavours. Top quality vinegars/soy and chilli sauces. Crisp seafood and crunchy vegetables. I often come out of a dim sum lunch with my mouth feeling claggy, and the dishes have been a bit mushy, mealy or greasy. Here, the dim sum is somehow best described as precise. Really, really good. My favourite place for dim sum so far in HK. Drinks: I’ve only ever had tea with lunch, but they have a lovely menu for this – a big range of top quali infusions. 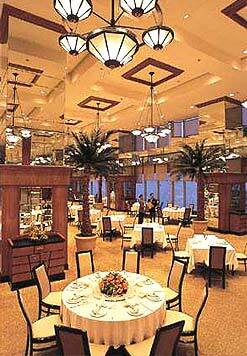 Ambience: Such a stunning dining room. I love it. It’s 2 stories high, with humungous floor to ceiling windows looking down the harbour to Lei Yue Mun and beyond, completely bathed in light. The tables are set incredibly wide apart so it is the ultimate place for a business lunch. Nobody can overhear you no matter how large your group. The beautiful porcelain tableware is specially commissioned (I always want to steal it cos you can’t buy it anywhere), and the flatware is is terribly ornate too. The carpets are so deep it’s a danger to walk too quickly in your Giuseppe Zanottis. What with the soaring ceilings and shag pile all noise is mopped up, so all you end up hearing is a background of reverential murmuring as though you are in some high church of dim sum worship. Price: $200-$300 per person for lunch.